My Blog - Ladakh’s Artificial Glaciers: A solution to climate change or a creative practice of coping? Carved from naked rock and rutted mountains and situated in the vast rain shadow of the Himalayas, Ladakh is a place that upon first encounter feels uninhabitable. Yet, high above the green Indus River, people have been carving an existence out of this rugged desert for over 1,000 years. 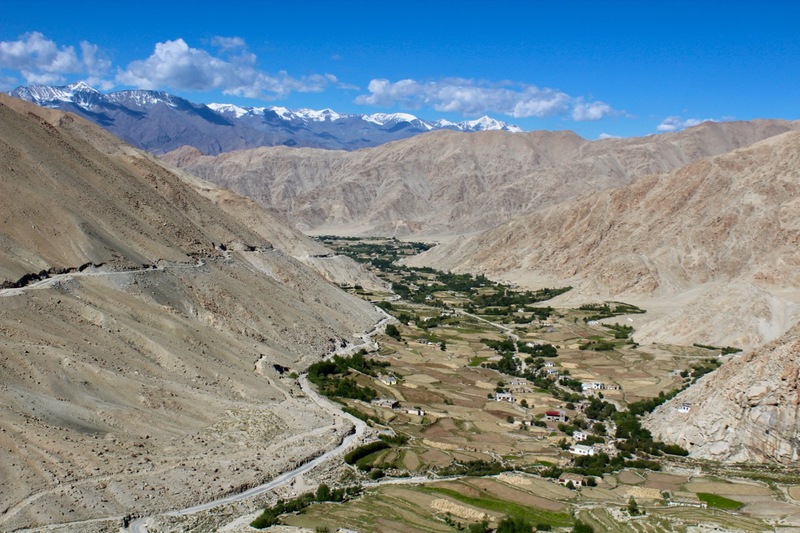 Although 85 to 90% of villages completely depend on glacier and snow-fed catchments for their water (Norphel & Tashi, 2014), Ladakh is have managed to make life flourish in this extreme landscape by channeling seasonal flows from melting snow and glaciers through complex irrigation and storage systems. 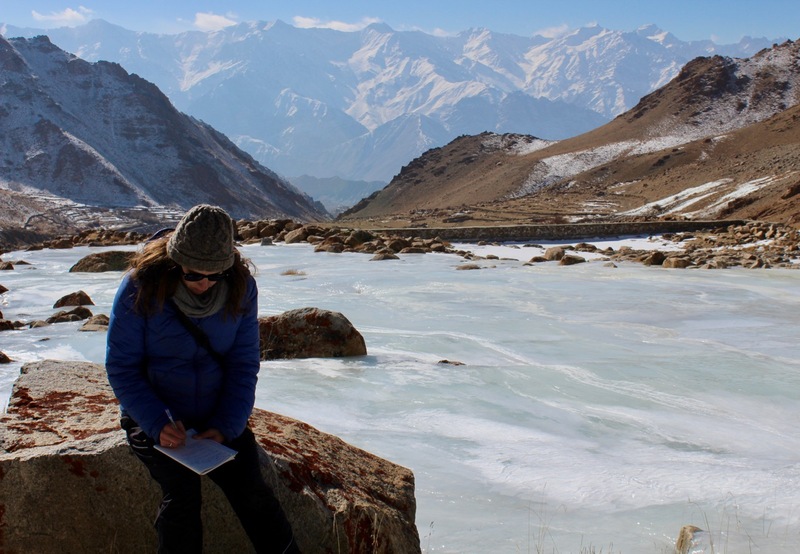 It is for this reason, that I went to Ladakh as part of my Fulbright-Nehru Student Research Grant to study the ways in which both ancient traditions and modern interventions there might inform ways of coping with climate-induced water scarcity broadly. Irrigated valleys of Ladakh are flush with greenery, in stark comparison to the surrounding landscape. 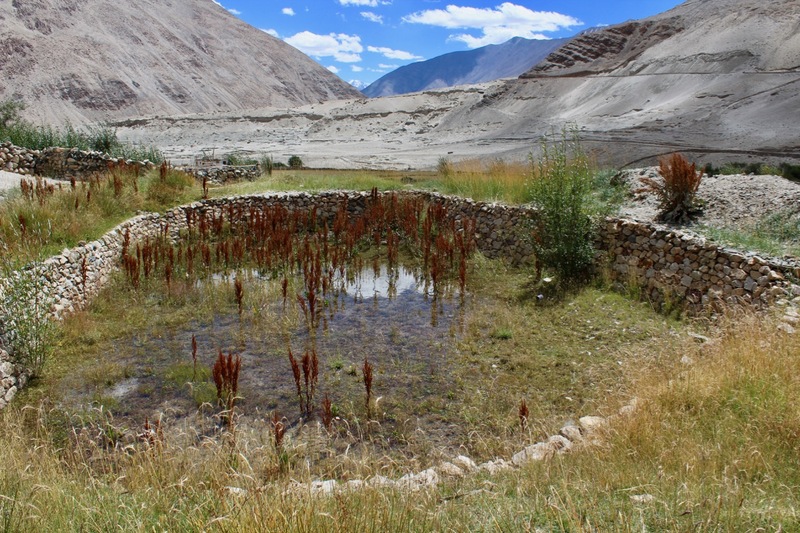 Even with their time-tested traditions of water management, however, climate change is testing the Ladakhi’s capacity to survive as glaciers across the Himalayas retreat at astounding rates of a few to tens of meters each year (Hasnain, 2002). In just the last six decades, the Indian state of Jammu and Kashmir of which Ladakh is a part has lost 20% of its permanent ice reserves (Clouse et al., 2017). As entire bodies of formerly-permanent ice have disappeared within a single lifetime, villages increasingly depend on dwindling winter snowfall to recharge local springs and streams, a precarious existence as annual precipitation in Ladakh is on average less than two inches of rain and three to four inches of snowfall (Norphel & Tashi, 2014). In this way, water scarcity is becoming acute. Indeed, some of the worst-off villages have been forced to relocate (Mingle, 2015), and for those that still have sufficient flows—often buffered by the melting glaciers above them—scarcity looms on the near horizon. Streams are fed almost exclusively by seasonal snowmelt and glaciers in the upper catchment. 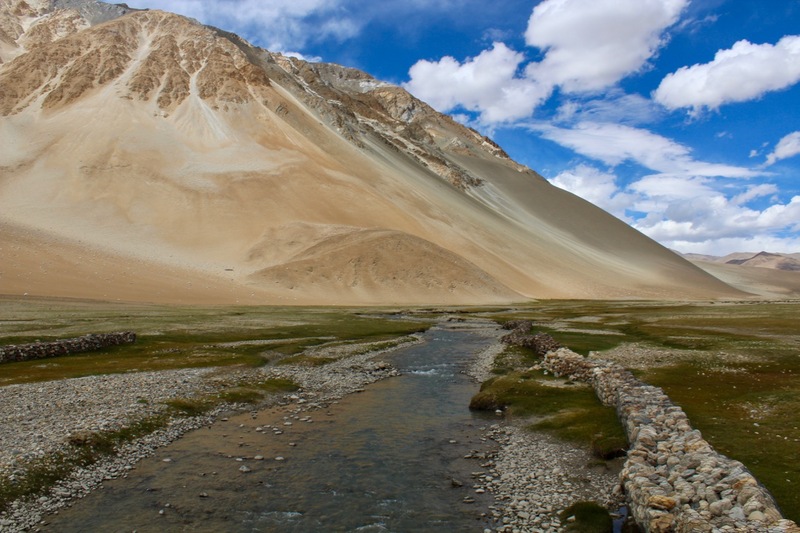 In response to this increasing water scarcity, several non-governmental organizations (NGOs) are building what are called “artificial glaciers” (AGs) across Ladakh. These innovative structures are essentially human-made ice banks that are used to provide irrigation water in the early spring and to buffer reduced flows by capturing winter water in the form of ice. AGs, at least in their modern form, were invented by Chewang Norphel, a Ladakhi civil engineer, who in the late 1980s began experimenting with low-tech structures for capturing water in the form of ice in water scarce villages. One in a series of terraced dry stone masonry walls used at the Likir Artificial Glacier to collect ice. The basic idea of an AG is to divert a spring or stream through a small canal or plastic pipe to a shaded hillside. There, the water is slowed and spread to increase its surface area and exposure to the cold to enable freezing. While Norphel’s original AGs were made using stone and gabion walls to form terraced fields of ice alongside the main stream channel, other more recent experiments have built them as free-standing towers or by spraying water on vertical rock walls to form a frozen waterfall. Different technologies enable AGs to be designed according to the specific conditions of each village and the upstream topography it has to work with. Regardless of design, however, all the structures accumulate ice from late November to early March and begin melting just in time to provide water for spring irrigation. An artificial glacier in Nang is situated in shade for most of the day, making it ideally positioned for ice accumulation. While Norphel was inspired to build his first AG after walking past a broken water pipe that had flooded a plot of land and frozen in the shade near his home, the practice of harvesting snow and ice through human-made structures is actually an ancient tradition in Ladakh. Even before anthropogenic climate change, farmers in Ladakh faced water scarcity as year-to-year fluctuations in snowfall could spell doom for a village if there was insufficient water to irrigate come spring. For this reason, people traditionally invested a huge amount of time and labor not only into maintaining irrigation infrastructure within the village, but also in building structures above these systems to capture and store water. Rock-lined reservoirs called dzings, for example, are the most common water harvesting technology still used in villages today to capture and store water overnight for irrigation the following day. Indirectly, they also recharge groundwater and local springs, as their porous floors and walls enable percolation. Villagers in Nang maintain flows in their irrigation canals throughout the year. Artificial glacier in background. A traditional dzing, made with stone walls and a porous bottom, to store water daily throughout irrigation season. 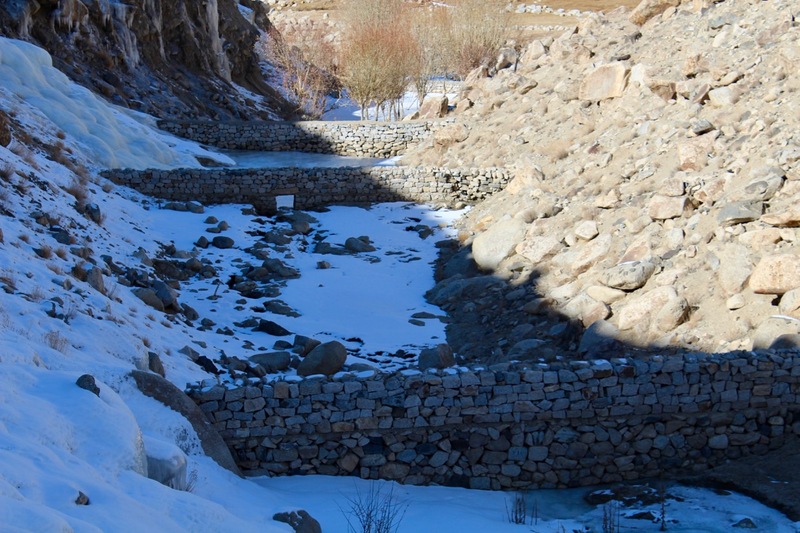 Further upstream, some people also used to build dry masonry walls (very similar to Norphel’s early AGs) called gangskat (literally “snow block” in Ladakhi) to trap water in the form of ice during winter months. 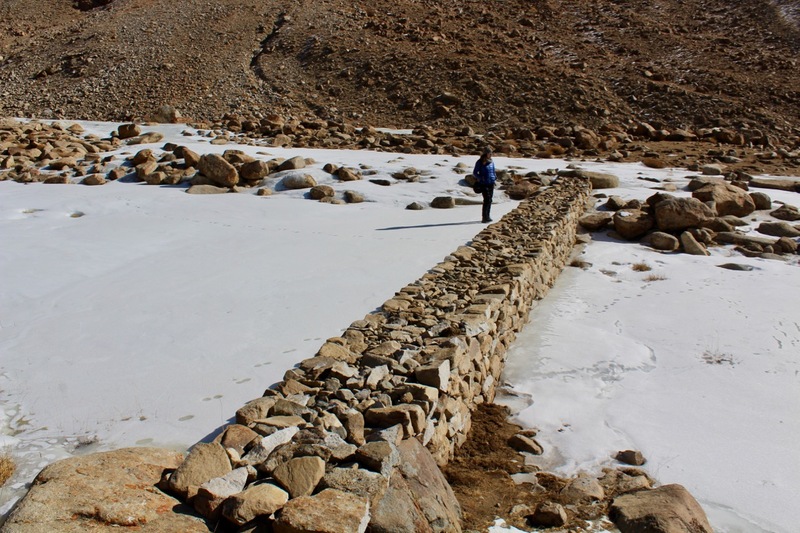 With careful placement, these simple stone walls could be used to harvest snow from avalanches or prevent it from blowing from one mountainside to another, thereby keeping it within a particular watershed. These structures, however, have not actively been built in any of the villages that I visited for at least 50 years due to communal systems of labor eroding with an increase in government-funded development schemes. This traditional knowledge and its loss is a topic that I hope to study and document in coming months, for it seems that in places where these traditions have not already disappeared, they may die with Ladakh’s oldest generation. It is ironic that even as AGs continue to be built and extended in Ladakh as a “solution” to climate-induced water scarcity, their indigenous sister traditions go unrecognized and neglected. The Tata Trusts, for example, are currently working with three different NGOs to conduct feasibility studies on the potential for building AGs in 34 villages across the region. At the same time, Sonam Wangchuk’s Ice Stupa Project (essentially a two-story dome-shaped AG, designed to be built at lower elevations with reduced surface area to slow thawing) has received so much attention both inside and outside Ladakh that the project site in Phyang often gets hundreds of visitors in a single day. The Ice Stupa in Phyang, approximately one month into its formation. Even the monasteries of Ladakh are now beginning to build glaciers. 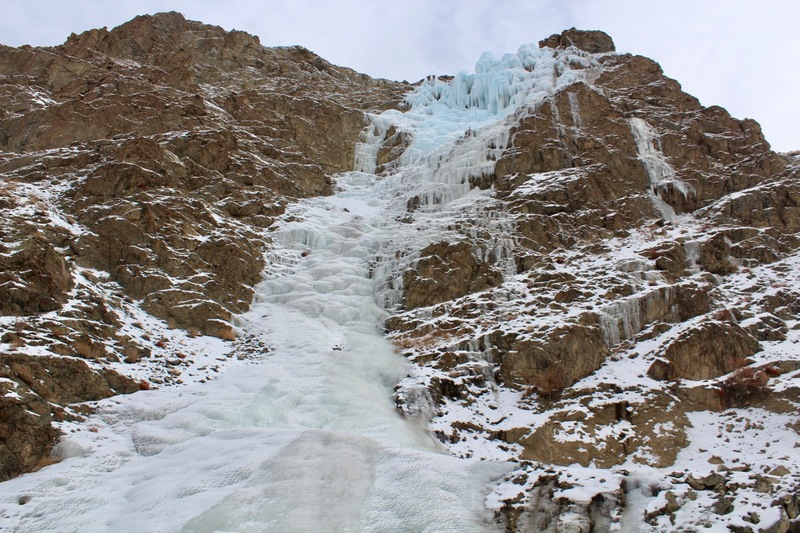 In the winter of 2016-2017, Tibetan Buddhist teacher Chetsang Rinpoche sponsored his first “artificial icefall glacier” (a low-tech AG built with simple piping that delivers water to a shady cliff and sprays it to form ice) in Kuksho village and has since expanded into two others. 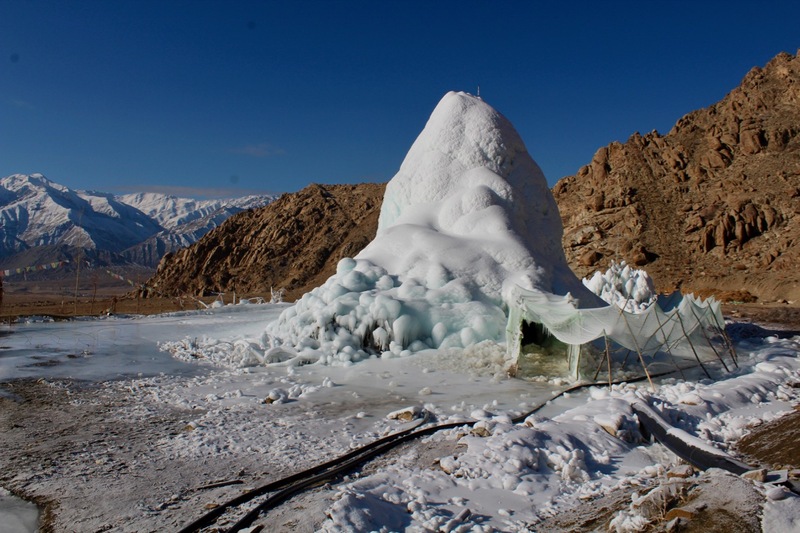 Chetsang Rinpoche's Artificial Ice Fall Glacier in Atitse village, located in the Sham Valley. The 100-meter high Artificial Ice Fall Glacier in Kukshow village, approximately two months into its formation. While it is exciting that so many diverse institutions are building AGs and adapting them in creative ways, it seems that both the builders and beneficiaries are still failing to face the limits of their own interventions. For example, rather than looking more deeply to traditions and social institutions for harvesting water to inform the ongoing development and innovation of what has become—or rather been reinvented as—a ‘modern’ technology, the builders of AGs increasingly turn to science, technical experts, and large-scale donors. While these sources of expertise certainly have a place in informing climate adaptation, it seems short-sighted to ignore, and even risk losing in the meantime, other forms of place-based knowledge that could also offer insights for survival. Moreover, while AGs may assist Ladakhis in coping with water scarcity for a period of time, in the same way that gangskat and other traditions have historically, fundamentally they cannot be a solution to climate change or scarcity in the long-term as they only preserve, for a few months, the water that is already present in the mountains. No matter how high-tech the structures become, if Ladakh’s natural glaciers continue to disappear and the skies refuse to snow, AGs can do nothing. This humility, however, is often lacking in interventions. In fact, the more time I spent visiting project sites and volunteering with NGOs on their interventions, the more it seemed to me that in some ways AGs have—or at least have the potential to—become more of a ‘water grab’ than a real solution: a desperate attempt to capture and keep whatever one can before it is gone. In many of my interviews with both villagers and NGO representatives, water was framed as “wasted” if it flowed out of the village, beyond the borders of Ladakh, and certainly if it was “lost” to Pakistan. Perhaps this is what coping with climate change looks like in places where resources are already profoundly scare. Water becomes framed as something to be claimed in a game of survival, where the needs of downstream users or those who live just over the border are not considered in local adaptations. Taking notes will doing a site visit in Likir with NGO staff to check on the formation of a brand new artificial glacier. This is perhaps a cynical reading of Ladakh’s AGs, which are otherwise seen as a locally-rooted adaptation worth celebrating and replicating across the Himalayas and in other mountainous regions. While it is important to highlight the AGs successes, it is also necessary to confront the basic limitations and realities within which they operate. Although AGs may be inspiring creative ways of surviving anthropogenic climate change, they are certainly not a solution to this global disaster. Being clear about this, Ladakhis on the frontlines of climate change should continue to build and innovate AGs to meet their water needs. However, it seems to me that some of these interventions might also think more broadly about the diverse forms of knowledge they draw upon to inform their projects. For example, more closely involving hydrologists and geologists in identifying project sites and the placement of AGs may improve the capacity of interventions to recharge local water sources. At the same time, it seems worth investing time into understanding the traditional knowledge that already exists about how to harvest and cultivate ice, particularly among the oldest villagers. At the end of the day, one would hope that our collective efforts at survival, not only in Ladakh but across the globe, will draw not only on a narrow form of expertise, but on the broadest, deepest, and most ancient ways of living on the planet as well. Clouse, C., Anderson, N., & Shippling, T. (2017). 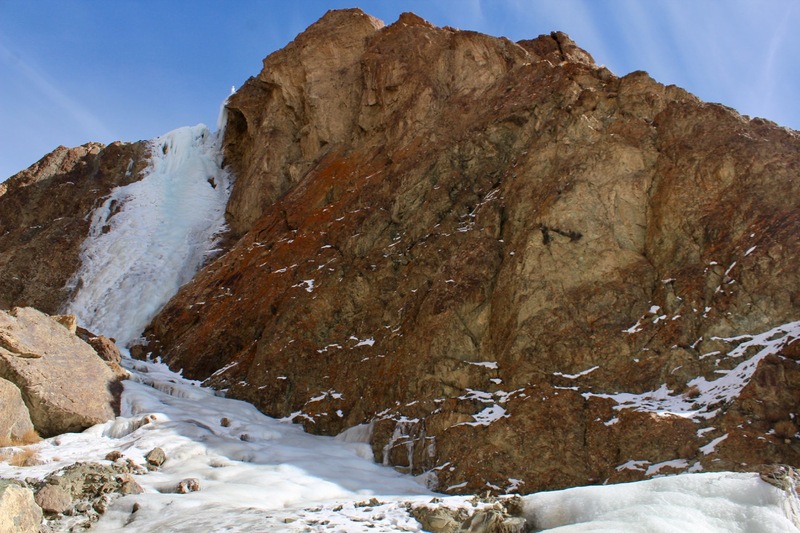 Ladakh’s artificial glaciers: climate-adaptive design for water scarcity. Climate and Development, 9 (5): 428-438. Hasnain, S.I. (2002). Himalayan Glaciers Meltdown: Impact on South Asian Rivers. IAHS Publication No. 274: 1-7. Mingle, J. (2015). Fire and Ice: Soot, olidarity and survival on the roof of the world. New York, NY: St. Martin’s Press. Norphel, C. & Tashi, P. (2014). 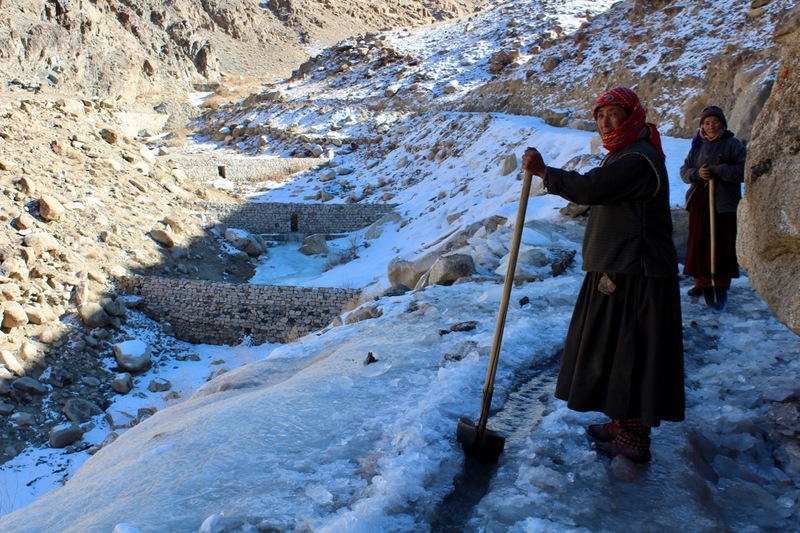 Snow Water Harvesting in the Cold Desert in Ladakh: An Introduction to Artificial Glacier. In Mountain Hazards and Disaster Risk Reduction. Nibanupudi, H.K. & Shaw, R. (Eds. ), pp. 199–210. Tokyo: Springer Japan.